Looking for an easy way to monitor your computer’s performance? 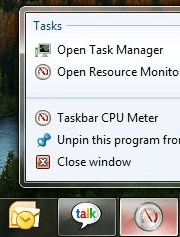 The Taskbar Meters app lets you keep PC performance stats in view at all times. Although this may not be practical for everyone, PC builders and hardware geeks may find it quite useful. If you aren’t a fan of the whole Windows 7 widgets, this is a better solution for you. The app is called Taskbar Meters. It’s not the most feature rich app out there. But sometimes simplicity is the key. It does one thing and does it right. To get started, head on over to Codeplex and download the file. It shouldn’t take more than a couple of seconds to download, with a high speed internet connection. Unarchive the downloaded zip and extract the files to your computer. From there, open up the folder labeled TaskbarMeters v1.1. There will be several files located inside the folder. Ignore the files ending in .dll. 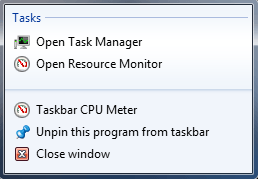 The other three files are the taskbar CPU meter, taskbar disk IO meter, and the taskbar memory meter. Double click one of them to launch it. 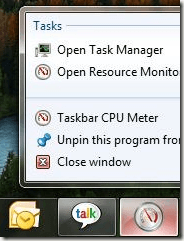 It may take a minute or so to start up, but once running, it should show up in your Windows 7 taskbar. The meters don’t show exact percentages. However, they do give you a general idea of how much resources are being used. You can also click the meters to bring up options for that particular meter. There are not a lot of options to choose from. But, you can adjust the update frequency as well as the yellow and red zone colors. To add the additional meters, simply double click their icons within the TaskbarMeters folder as well. One cool feature about these meters is the ability to jump directly to Windows 7 Task Manager or Resource Monitor to see what is slowing down your PC. To do this, right click on the icon and you should see the quick links to Task Manager and Resource Monitor under the Tasks section. Basically, that’s all there is to it. Simple, but very effective, and cool looking. 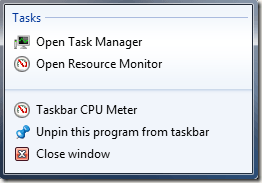 This is a much easier way to monitor system performance then launching the task manager each time you need to check performance.